For the past 16 years, RateMyProfessors.com has been an awfully helpful tool for millions of college students. It has provided a method of rating, ranking and selecting professors that students feel best fit their learning style while passing on to prospective students a guide for their own future decisions. With its simplistic set-up – a green happy face for a positive ranking (4.0-5.0), a yellow sideways frown for a medium ranking (3.0-3.9) and a red sad face for a negative ranking (2.9 to 0.0), as well as a chili pepper to rate a professor’s “hotness” – the site has reached widespread cult status on campuses across the country and around parts of the globe. But the site, and the legitimacy of its content, is a hot-button issue that has largely unknown effects on professors, the students they teach and the institutions that employ them. With over 7,000 institutions represented from around the world, from major universities to junior/community colleges, RateMyProfessors.com is far and away the largest-known destination on the web for professor critiques and judgment of performance. Since its creation in 1999, users have added more than 15 million ratings to over 1.4 million professors. It’s no secret that students at JJC utilize the site and conduct their own ‘employee reviews’ on their instructors. One look at the JJC portion of the site reveals thousands of reviews, with a vast majority lying in the always tension-riddled subjects of math, science and humanities. Overall, JJC as an institution holds a solid 3.6 overall rating (with a measly 120 total ratings considering JJC’s fall enrollment in 2014 alone was 15,776). Representing JJC are 1,021 current and former professors, with the “Most Rated” tab giving students the ability to organize professors from the most rated professors to the relatively obscure. Not every professor at JJC is present on the site, but a vast majority are, and the commentary from their anonymous judges range from critically reasonable to laughably inane. But how do professors and instructors, all highly-trained and expertly qualified in their fields, view the site? It depends on who you ask. “In terms of how teachers look at it, I think there are teachers who don’t even care that it exists and some teachers who really look at it,” said John Bialas, an assistant professor in the mathematics department. While students provide the feedback, that feedback is not always given under honorable circumstances. Much in the way that a convict put away for life is not exactly going to be eager to give the prosecutor a high performance rating, the same can be said for a deservingly failed student with an axe to grind. While that lurking variable exists, the fact remains that the only way to truly know how effective a professor is at their job is to ask the pupil. Lyons’ suggestion of bias is strongly backed by Eric Pitts, a computer information systems major at JJC. 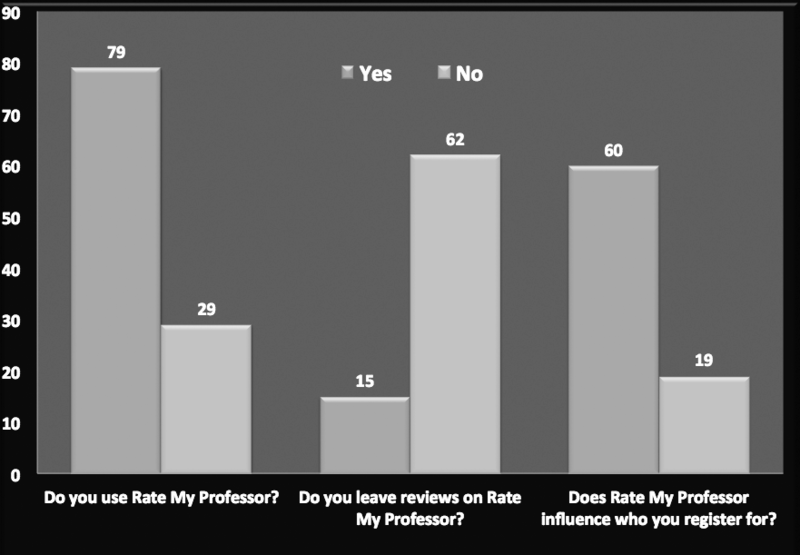 The legitimacy of consistent negative ratings, or patterns in comments, is one aspect of Rate My Professors that has found a degree of gospel-status among students, but what that degree is exactly is up for debate. “I think it does become legitimate after a certain amount of times; now how many? I don’t know,” said Prof. Bialas. Lyons also hit on a familiar form of bias that runs rampant in ratings of JJC professors – accents. Lyons stated that he’d had professors from Pakistan, England, Germany, Trinidad, South Africa, Cameroon, and even one born in the Soviet Union. The site’s complete vulnerability to rating manipulation (for example, one person rating the same teacher multiple times) and its complete absence of accountability on the part of the student or any shred of transparency makes its total authority a dubious proposition at best. But therein lies the problem. Are there irreparable holes in Rate My Professors’ structure? Absolutely. But the trickle-down effect of its use has results both good and bad, real and perceived. For instance, even if a teacher doesn’t check their rating, having the knowledge that it’s working to a professor’s advantage makes it a tool for them, even if they aren’t driving the use of it. “If the ratings are good that’s great because I guess students are finding me and I enjoy having a full class because then I can do more things,” said Heidi Lyne, an assistant professor in the mathematics department. Prof. Lyne does not view the site, nor does she design her curriculum off of what it says, but plenty of professors do utilize it as a tool to compile feedback that can, admittedly, be hard to come by. Margot Underwood, an associate professor in the Social and Behavioral Sciences department, encourages her students to view the site for class information, but believes that the accuracy and intent of the feedback the site contains must reflect the true purpose of the site – to inform. “The problem is that some people use it as a way of saying I didn’t get the grade I wanted and you get people who are really, really negative or really, really positive. So I would prefer it if it would be based on content,” said Prof. Underwood. Teachers have an obligation to their students to give them the best path to success in their classes. For Prof. Underwood, that obligation extends to viewing all critiques, compliments and criticisms, no matter how slanted and unproductive they are. An argument can be made that rating a teacher on “Easiness”, one of the sub-ratings available for students, would be counter-productive for professors the higher their ‘Easy’ score goes. Prof. McGuire, who runs the gamut of math classes he teaches – from 094 to Calculus 2 – absolutely loves to teach. A professor must teach 15 credit hours per semester to be considered full-time; McGuire teaches 30 hours, with no semesters off. A tough and regimented professor, McGuire models his classes after what the corporate world will expect of prospective employees when they walk through their door long after their days in pre-calc. While Prof. McGuire feels the information on Rate My Professors is of little to no use to him personally and professionally, and has never visited the site himself, he believes that younger professors without tenure, those breaking into the field and in search and need for feedback, can be susceptible to negative comments on the site. The site’s integrity, or lack thereof, is what gets under the skin of many professors, with some feeling the addition of a “hotness” rating undermines the entire process all together. What does a professor’s physical attributes have anything to do with the curriculum? Nothing. Zero. But while holes can be poked in the site’s lack of scientific integrity, its biggest issue is the general notion that only students that feel strongly for or against a professor use the site. Ultimately, per capita, it just doesn’t reveal what would be considered a usable sample size. Yet still, the site exists. Its ratings are used, recycled and sparsely updated as the semesters roll on, and while the students posting fall into the extreme categories of ‘loved it’ or ‘hated it’, that notion doesn’t cover the silent majority that does visit the site and uses the information with stealth regularity. That brings the discussion to enrollment and employment. Specifically, what effect does this site have on those aspects, and do administrators and higher ups view the site? Stewart urged students to participate in the school’s official course evaluation process to ensure that their feedback is seen by faculty, deans, department chairs and Dr. Stewart herself. While the institutional opinion of the site toes the company line, there are enough whispers and musings around to suspect that the site’s content at least holds some level of influence among faculty and students. While getting an exact reading on the site’s influence is like trying to count to infinity, there is no debate that the site, its undoubtable helpfulness for students and unquestionable bias creates an issue that is both largely unexplored and clearly impossible to eliminate. Assuming the role of Editor-in-Chief for the Spring 2015 semester, Joel is a journalism major, due to graduate with honors from JJC with an Associates in Arts in the Spring. Joel served seven years in the U.S. Coast Guard (2005-2012) and wrote sports columns for the Corpus Christi Caller-Times in Texas from April 2009 to October 2014. Assuming the role of Editor-in-Chief for the Spring 2015 semester, Joel is a journalism major, due to graduate with honors from JJC with an Associates in Arts in the Spring. Joel served seven years in the U.S. Coast Guard (2005-2012) and wrote sports columns for the Corpus Christi Caller-Times in Texas from April 2009 to October 2014.